The West End is perfectly situated to the west of Princes Street, so it's very central and easy to get to. But, it has it's own independent spirit and community, making it a special and unique part of the city to visit. For guests staying in our West End holiday apartments, there's plenty to see and do. The West End is a lively part of town. Based around William Street and Stafford Street, there are lots of galleries, theatres and cinemas to enjoy. The pretty cobbled streets are home to many independent shopping boutiques, cafes, bars and restaurants. As well as lively city living, the West End offers many picturesque views and walks. Both the Union Canal and Water of Leith walkways are close by. They offer lovely, waterside walks to other popular Edinburgh neighbourhoods, like Stockbridge and Dean Village. The area is close to lots of Edinburgh attractions and landmarks. Including St Mary's Cathedral, Georgian House and Edinburgh Gin Distillery. 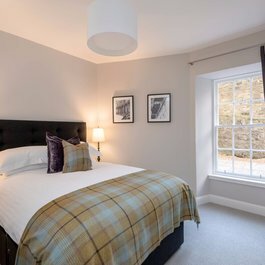 And, if you're a rugby fan, Murrayfield Stadium is just a short walk away. At the West End, Haymarket railway station is right on your doorstep. And, there are direct trams running between here and Edinburgh Airport. So, it's an easy area to reach by train or plane. The local bus service runs through here regularly, so you're well connected with the rest of the city too. 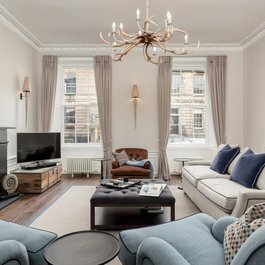 Edinburgh's West End is the ideal place to stay on a visit to Edinburgh. And if you haven't found the perfect holiday home yet, we can help. 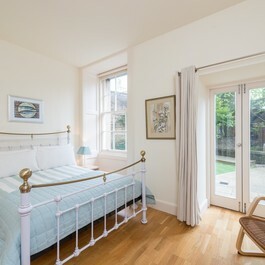 Here at Lets Get Local, we have some beautiful West End holiday lets. So, take a look and please get in touch if we can help you to find your perfect self-catering accommodation.